Covington, VA (Appril 2, 2019) - The Alleghany Living magazine is now available at the Alleghany Highlands Chamber of Commerce & Tourism office/Visitors Center. This high quality, magazine-style, full color presentation will serve as a primary marketing and welcoming tool for the area for new and potential residents. 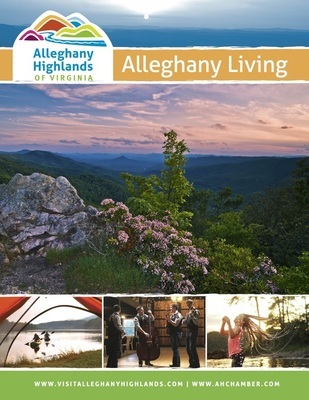 The Alleghany Living Magazine will also be used in the community’s economic development programs to help attract quality investment in the Alleghany Highlands. Area businesses are encouraged to obtain copies of the magazine for display at their business and in recruitment of new employees. A digital edition of the 60-page magazine will also be available online at www.ahchamber.com. The magazine boasts 40 advertisers, numerous photos taken by local photographers and articles written by local residents. The magazine represents the Alleghany Highlands and all the many programs, services and activities that we have to offer. The magazine, created by Leisure Media 360 and the Alleghany Highlands Chamber of Commerce & Tourism, will be placed in local hotels, doctor and dentist offices, real estate offices and local businesses. It will also be mailed to thousands of individuals requesting information concerning the Alleghany Highlands each year. Please call the Alleghany Highlands Chamber of Commerce and Tourism at (540) 962-2178 for multiple copies for your business or stop by the Visitor Center at 110 Mall Road in Covington.